Not by chance. Not at a book signing. Not in an elevator. On purpose. At his house. Invited by him. And the Kirtsy Girls. For all of you wondering, Dear Readers, who Guy Kawasaki is, read this. For all of those who know who Guy Kawasaki is and know that he's a guru of mine, say "Yay." 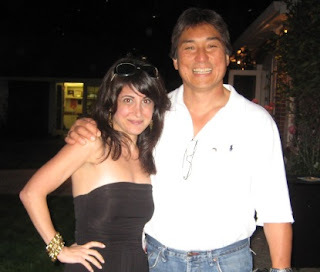 Because I met Guy Kawasaki. Guy and the Kirtsy Girls sponsored this party in honor of some the amazing blogging women who came to Blogher 08 in San Francisco this past weekend. Actually, it's still going on. But I left early to manage SavvyAuntie.com. There's a lot of work to be done. Having the chance to meet Guy was just one of the perks of launching a company people care about it. So thanks, Kirtsy Girls, for inviting me. Actually, if you look closely at Guy's smile, he does seem to be happy to be in the picture with me, right? Maybe this is just the beginning of my kinship with Guy. I should keep a check list of little dreams come true. we were there and we did not meet :( love you!!! and so glad you met Guy- He is so fabulous! Aw too bad we didn't meet! I missed so many amazing people that night. Nice post and picture of you two. I wrote an article at http://autismspectrumdisorders.bellaonline.com on unique member sites where you will find a snippet on Savvy Auntie. Great Pic and congrats on having one more dream come true!!! Guy is the best of the best! I'm so honored to have met you... over Israeli wine! How many of those "I love Guy K." buttons did you wear home?